1.MODE-Press" MODE" to select from the three modes: "PROBE 1", "PROBE 2" or "TIMER"
MIN / ° C / ° F -In "PROBE 1" or" PROBE 2 "modes, long press "MIN/℃/℉" for 2 seconds to switch between ° C and ° F; In "TIMER" mode, set minutes for the timer. 5.In "TIMER" mode, set seconds for the timer. 6.START / STOP - In "PROBE 1 "or "PROBE 2 "mode, press "START / STOP "once to turn on or off the temperature alarm. Long press "START / STOP" for 2 seconds to enter to the "TEMP SET"(setting manually) for" PROBE 1 "or" PROBE 2". 2. LIGHT / ON - Press"LIGHT / ON" to turn on or off the signal transmission (when the signal transmission is on, the signal identification will flash); Long press"LIGHT / ON" for 3 seconds to turn on or off. 1.Press "MODE" to select the thermometer MODE: "PROBE 1" or "PROBE 2"
2.Long press "START/STOP" for 2 seconds to enter to manual setting mode (numerical flicker). Press "MIN" or "SEC" to set temperature. 3.After finishing setting, press "START/STOP" button to turn on/off the temperature alarm setting. When the temperature alarm setting is turned on, it will display on the screen. 4.When the temperature of "PROBE 1" or "PROBE 2" reaches the preset level, the receiver will make a beeping sound, and the red liquid crystal backlight will be on. Press any button to stop the beeping. 【Sensor Probe Lifetime Warranty】Our probe is made of food-grade stainless steel, which can meet the IPX7 waterproof standard. Improper use or exposing to high temperature too long may result in incorrect temperature readings. In such case, please feel free to contact us, and we will provide you with a new sensor probe for free! 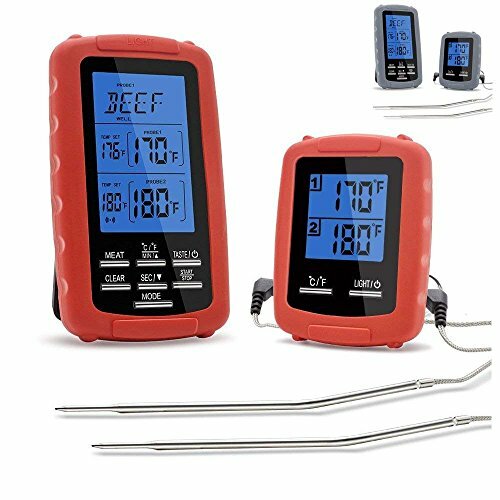 【Remote Monitoring Alarm 】The wireless digital barbecue thermometer with alarm can monitors the temperature of food or oven within 230 feet (70 meters), so that you don't have to keep your eyes on the food all the time, making time for other works. 【Multi- purpose】 Thermometer measuring range up to -20 ℃ ~ 300 ℃ (-4 ~ 572 ° F), which can arbitrarily meet your preferences for food ripeness. The thermometer has count and countdown function to avoid over cooking. 【Fast and Accurate Temperature Measurement】 The thermometer can read the temperature value within 7 seconds and transmit it to the receiver in your hand in real time. 【Packing list】:1 x digital thermometer receiver，1 x digital thermometer transmitter ，2 x food / oven temperature probe，1 x instruction manual. If you have any questions about this product by TBvechi, contact us by completing and submitting the form below. If you are looking for a specif part number, please include it with your message.